This book depicts the essence of hope in despair. Burnt into thin air, this was our destiny. Until we meet again, one day our worlds will collide. We are so selfish, because we are never truly in love with another human being. We are just in love with a reflection of our desires, an idealization of a dream, which, in the end, is merely our own. Aisha Chaudhary was born with S.C.I.D (severe combined immune deficiency) and underwent a bone marrow transplant when she was 6 months old. 2014 was a brutal year for Aisha as her disease progressed and her lungs started giving up on her. The last few months of the year felt like a roller coaster ride, one that seemed to be mostly going down. Spending almost all her time lying in bed, Aisha wrote down her thoughts to get some relief, to get them out of her head. Aisha’s life was not anything like the average life of an urban teenager, but she had experienced a lifetime of emotions; life and death, fear and anger, love and hate, the depths of utter sorrow and the happiest one can be. In My Little Epiphanies she takes a hard look at her own feelings and what it was that gave her a sense of hope and control. This book gave her purpose and meaning, something to hold on to. Sometimes Aisha’s little epiphanies have morphed into doodles that capture what was going on in her mind as her destiny played itself out. Through the book she wanted the world to understand her unusual life and hoped that it would inspire others going through similar hardships to find peace. 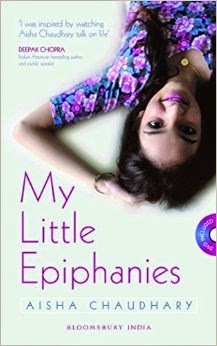 My Little Epiphanies is a masterpiece scribble by an eighteen year old girl who has a strong will power and a desire to live her life at its fullest no matter what. Normally, when there are things in our lives not going well, we tend to get upset and curse life and fate. But Aisha is an exception. According to her, ”We should be happy about things we can do instead of being sad about things we are not capable of.” She believes living in the moment and she implemented that in her life, can be seen in her book. While she was on the bed fighting every day with her illness, she made wonderful sketches, doodle, poured down her heart and mind through words, introspected herself and figured out what this life is actually all about. She was of my age. While reading I realized how painful her days would have been and yet she remained optimistic towards life. Her wisdom, way beyond her age. It’s amazing to see her beautiful interpretation about hope, fear, anger, love, life and people in it. At many places Aisha’s words pinched me to the core to think over it. This book depicts the essence of hope in despair. I am sure her maturity and deep understanding towards life will amaze you and will help you to stay strong in situations you think you would give up. There is a lot learn from Aisha, the little angel. Sadly, she is no more with us but her words and preaching will remain with us forever. She will remain alive in her readers’ heart. The book cover is beautiful with Aisha’s photo imprint. Inside the book you will find her colourful doodle and photos. The quality of pages is par excellence and it is a book you will cherish for a lifetime. If you are keen to comprehend about ways of life or seeking for positive vibes and inspiration, then you must read this book. Also, if you are a person who easily get demotivated and going through a dark phase of life must read this book. You will feel a new self after you complete reading it, I bet. A ☆ ☆ ☆ ☆ ☆ Book, recommended for everyone irrespective of age group. This book was gifted to me by a close friend. I am glad to read and review it. The opinions expressed in the review are my own, and remain unbiased and uninfluenced. I have given a five-star rating on Goodreads and FlipKart as I felt nothing less than that would be fair. Now I'm dying to read this book. Someone please send it to Germany!